This highly programmatic work is based on the story of Odysseus and his encounters with the Lotus Eaters, the Cyclops, the Sorceress Circe, and the enchanting Sirens among others. Multiple effects include col legno, mutes, and harmonics (which are all explained in detail in the performance notes). 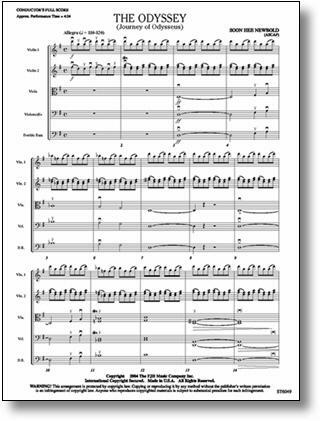 The incredible symphonic nature of the entire work gives your orchestra a huge sound without the need for any winds or percussion. Strongly consider this powerful new work!